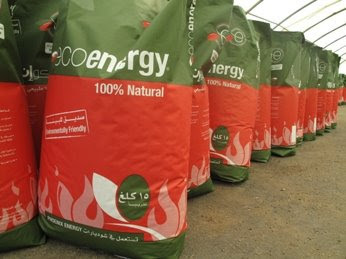 A new biomass product, developed by Phoenix Machinery, is both ecological and energy efficient. Phoenix Energy, a division of Phoenix Machinery, focuses on developing new renewable energy options for the Lebanese market. The company's new solid fuel boiler machine runs on biomass solid fuel - made from olive and grape husks, materials aplenty in the Mediterranean region. The boiler, fueled by solid fuel, packed in 15 kg bags, will help consumers reduce their impact on the environment. Solid fuel is a mixture of 100% natural renewable products: olive husk and grape seed husk and agricultural waste. Phoenix uses these agricultural by-products and waste given their abundance and solves oil producers' problem of discarding husk. These by-products, similar in cell structure to wood and fueled by the olive oil, are great for burning. The calorific value of dried olive husk around half as much as conventional heating diesel: 23,000 KJ/Kg compared to 40,000 KJ/Kg . Compared to other renewable energy sources, biomass is an economical contributor to reducing CO2 and CO emissions. When burnt at full combustion, olive husk CO emissions release approximately 100 parts per million (ppm) compared to diesel CO emissions at 400 ppm. In addition to reducing CO emissions, and unlike potentially toxic coal ash, biomass ash may be used as a soil amendment to replenish nutrients removed by harvest. .
You may also read this article at Phoenixia Newsletter. Management and exploitation of oil-mill wastes in the area of the NMPZ. National and Kapodistrian University of Athens. Utilisation of Olive Husk in energy sector in Cyprus. Fokaides, P.A. ; Dr. Tsiftes, K.